Third stay at the Bellavista Hostel! It was a pleasure like the times before. The staff was really nice, especially Thomas! He showed me around the city and told me everything i needed to check out in Santiago. Breakfast was really poor though. A few eggs and cereal wouldn't be a big effort and it will go a long way. Still very happy though! Amazing place! 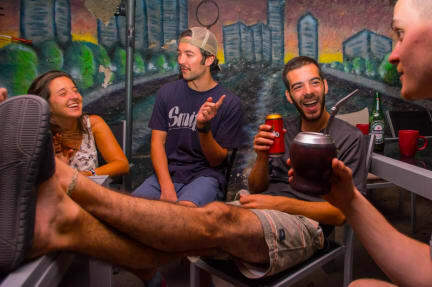 If you want to enjoy the vibrant nightlife of Santiago, Bellavista hostel is the place to be. Great staffmembers, cool parties and overall a wonderful experience. The only thing is that it could be a bit more clean, but hey its a party hostel. Just enjoy and go with the flow! Great location and atmosphere. Street side can be noisy till late in the weekend, so just join them! Breakfast really poor, location very good, atmosphere really good, rooms spacious, workers were not that usefull sometimes, annoying that you couldn't pay in Pesos Chilenos without a fee without knowing it before. Nice place but not much common area's for meeting people. 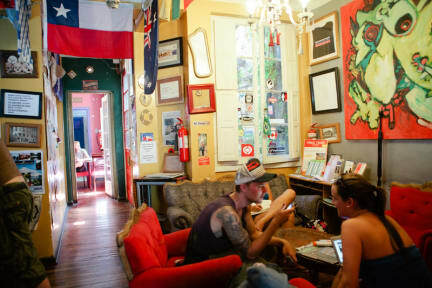 If you want to meet fellow travelers you go to there sister hostel who has a bar. Great place! Staff very helpfull, multilingual staff, nice rooftop terrace. The female dorm can be bit noisy because it's right next to the rooftop terrace. I will be coming back next time! Nice and sociaal atmosphere. The Area is great to stay in! Old hostel with basic facilities. Breakfast was really poor, but location was the best! Bario Bellavista is by far the nicest neighborhood with a lot of bars and restaurants. Fine hostel for a short city trip but not the best hostel with regards to atmosphere or longer stays. Great location, but my dorm had no windows which was not nice given the amount of people and the hot weather. For beers people go to the sisters hostel some blocks away.